Never in my life had I carried my laptop gracefully and fashionably, until I found this really smart fashion invention; indeed, the one and only bag that allows me to be in fashion all the time, The GRACESHIP. 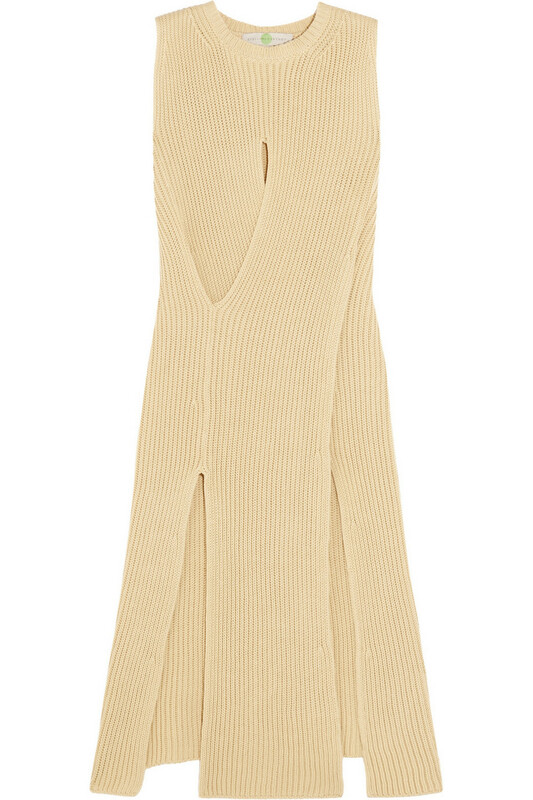 Being chic is perhaps every girl's dream, or even necessity for most of us. Sure it is, but I had never found a way of being stylish while carrying my laptop around, neither when I go to uni nor just strolling to the mall. Not to worry, big hugs to Emily Gimmel the founder of The GRACESHIP, our dreams now can come true. My favorite bag of all three goes to the classic black New York. I got this bag a few days ago and I totally love it. 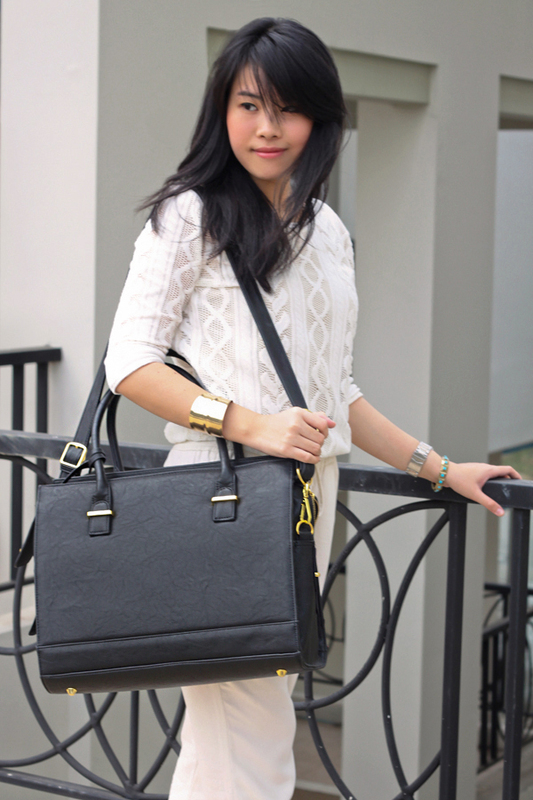 Just like how it's named, this sleek bag truly represents the city that never sleeps with all the sophistication. It definitely has what I look for from a laptop bag. 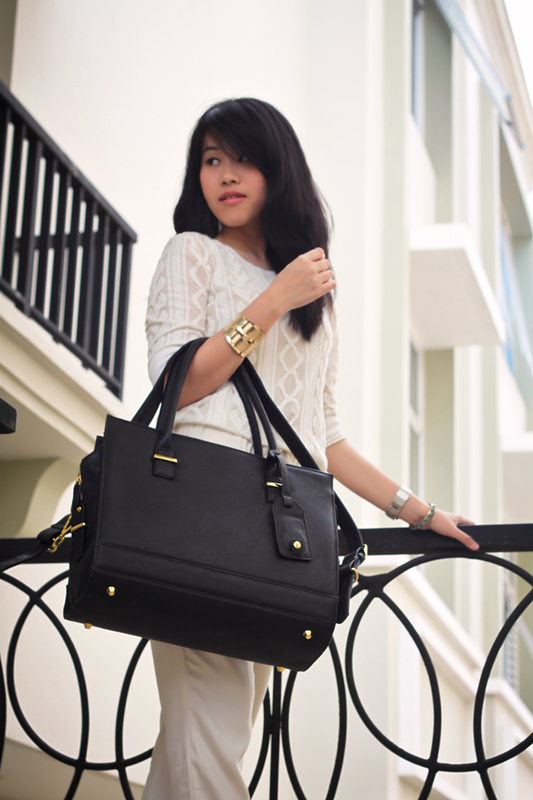 It really suits my need of a versatile bag that can be used everywhere, either to use it to uni or for a stroll to the malls. It also goes well with any outfits! 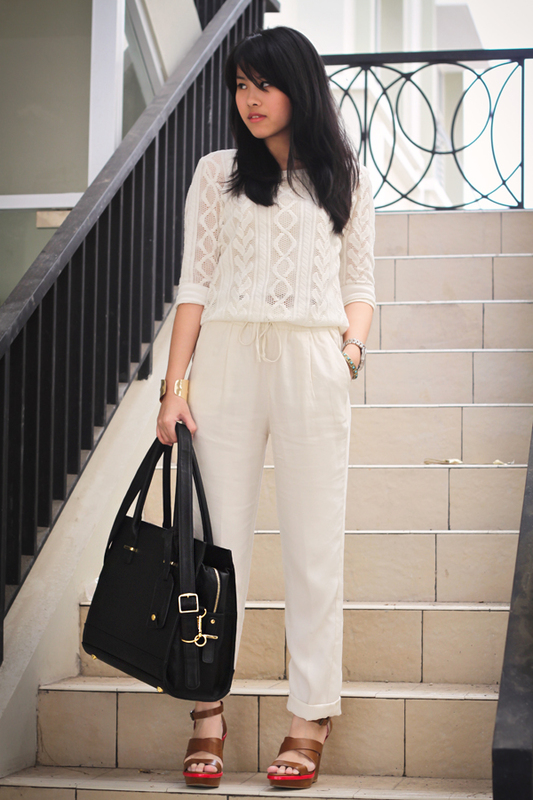 Simple all-white look with a bold color shoes like how I style or colorful blocking outfit, choose yourself! Moreover, people will never expected that it is a computer bag because of its fashionable look and that is exactly what I need as a fashion student. I love the fact that New York has 2 functional handle styles, the first one is the short double handles, allow me to carry the bag in style when I go out for certain events. The second one is the longer strap that will be very useful when I carry so many things, mostly when I walk to uni with a handful of my school stuff. Therefore, my heart goes to New York. The GRACESHIP offers 3 bags, each represents different style with their own personalities: London, Chicago, and New York. Don't worry, GRACESHIP ships internationally! ah, i love how you keep it really simple yet stay very chic chic chic. itu tas laptopnya ish minta dicuri banget!!!!!! what?!?! for someone who always has their laptop never too far away, i definitely need to get me one of these. you are absolutely adorable, girl! oh this would be so useful for me too! i carry my mac in a very unfashion way hahaha. the outfit overall is love! I am a big fan of white on white combinations!! like your bag.. stunning look! Beautiful pictures, loving that bag! very stylish! Wow! Incredible look )) I follow You! I really love this white on white look! That is a lovely laptop bag! Every bag that I have bought to carry my laptop and such never lasts because I use it soo much. Will check these out. You look so lovely! Gorgeous photos and lacey look! Followed you via GFC and bloglovin, hope you can do the same! wonderful pictures! i love the area around you. Nice lovely outfit! You look awesome with it. love your bag its great, i need to buy this. Wow! Your bag is just perfect!!! Size, shape, all! Great mix with white and coral accent on your shoes!! !